Les Journées des Plantes de Courson is one of France’s largest and longest running flower shows. Started in 1983 by a handful of passionate gardeners, the twice-yearly event has always been hosted by Helene and Patrice Fustier at their Château de Courson to the south of Paris. Over the last 32 years the show has grown enormously, now attracting over 30,000 visitors during the 3 day event and I imagine it was getting too large for Courson to handle. 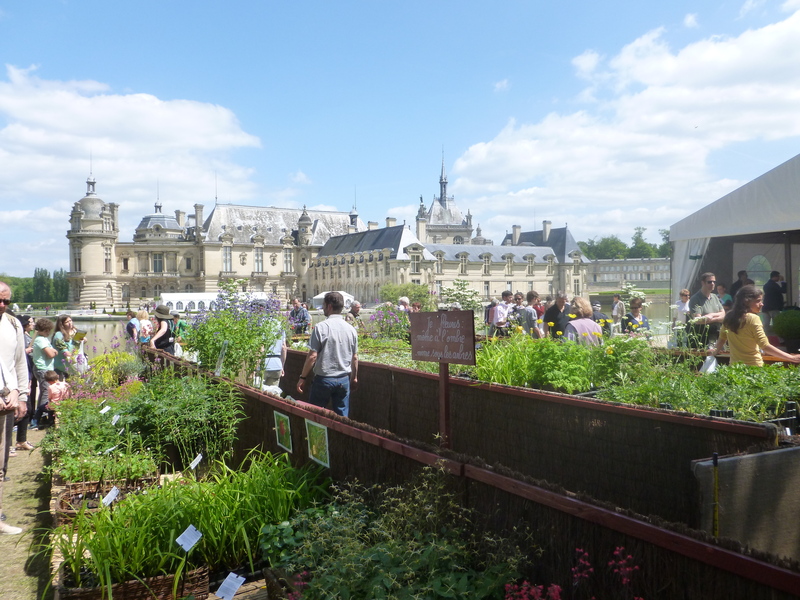 This year, the May edition of the show was held at the Château de Chantilly to the north-east of Paris, where the grounds are larger and access is easier for the specialist nurseries and suppliers that come from northern Europe, as well as France. Patrice and Helène are still heavily involved with the organisation of the show and the sight of Patrice directing operations from his familiar golf buggy warmed the hearts of anyone finding the change a wrench. The Château, the 18th century home of the Princes of Bourbon-Condé, is well worth a visit, holding one of the largest collections of antique paintings in France after the Louvre. The stable buildings are a masterpiece of 18th century architecture and are so large and grand they could be mistaken for the château itself. They are now home to the Musée du Cheval. However, it is the park and gardens that really dazzle those of us interested in landscape design. At the end of the 17th century, André Le Notre laid out a vast water parterre of large sky-reflecting pools, to which he added numerous fountains and a beautiful collection of sculpture. His design is unusual in that the Château is placed off-centre in the otherwise perfectly symmetrical composition. In the 19th century a picturesque ‘Jardin Anglaise’ was added, and it is here, around the bucolic lake complete with sheep with tinkling bells and a white classical temple, that the Journées des Plantes is now held. 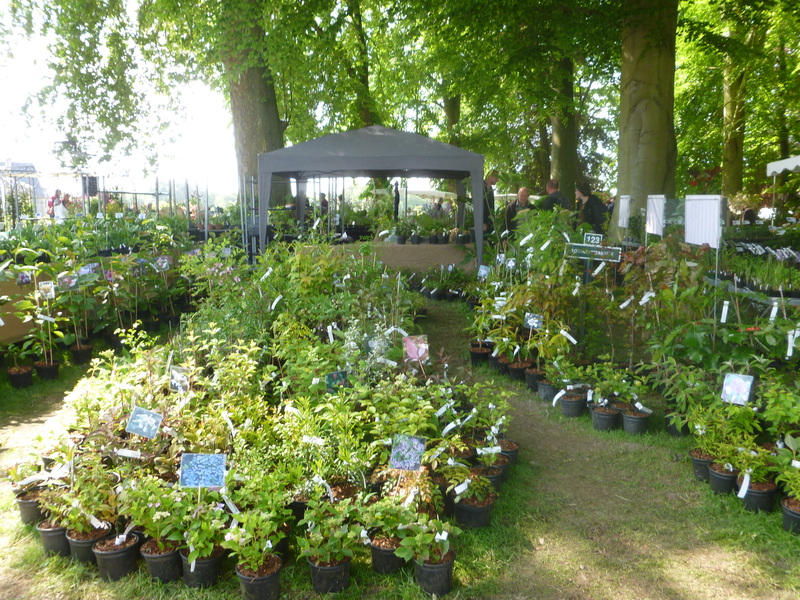 This year I was able to attend all three days of the show as I was helping on the stand of Open Gardens/Jardins Ouvert, a Anglo-French organisation inspired by the NGS in the UK, which encourages garden owners to open their gardens to the public for charity. Started in 2013, there are now over 90 gardens open in 17 French departements and growing fast. The placement of our stand was wonderful with this view of the château (above) before us, and the lake and tinkling sheep behind. 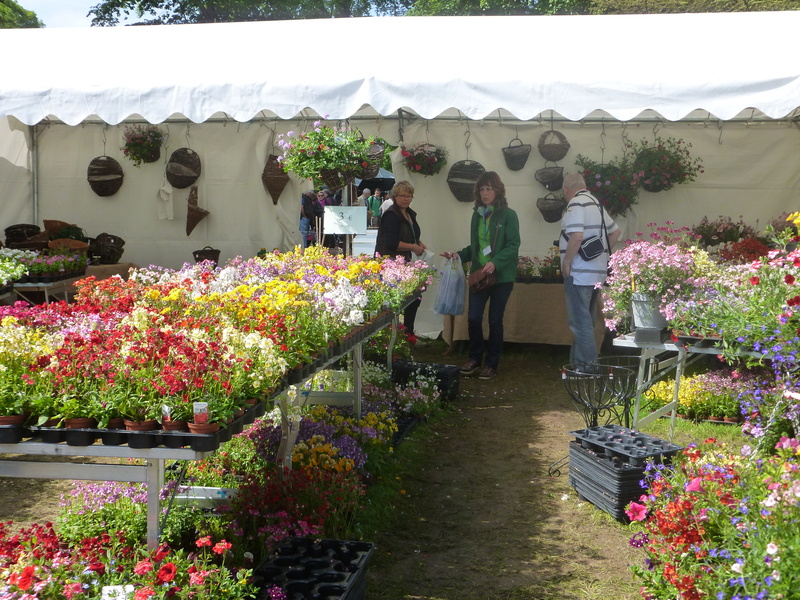 The show specialises in hosting small specialist nurseries so you are buying direct from the grower. 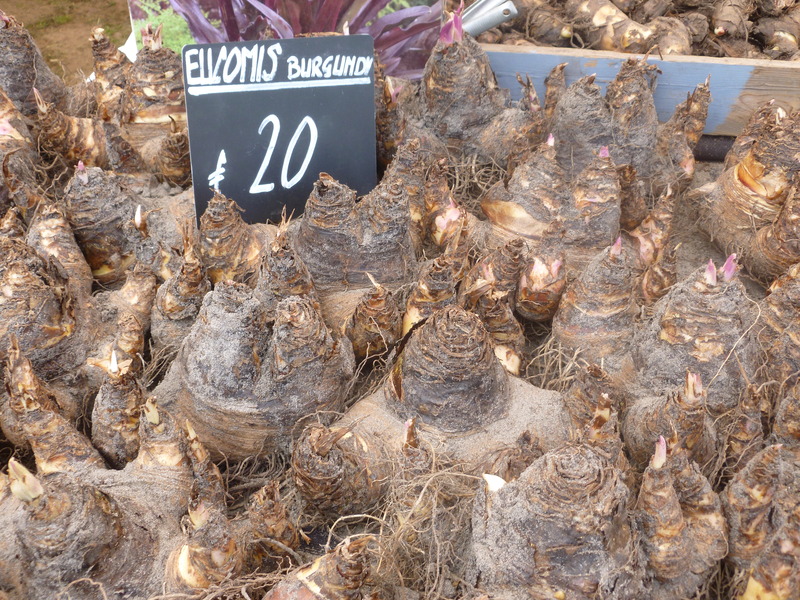 This means a huge variety of plants are available and you can find unusual or rarer plants difficult to find in a local garden centre. 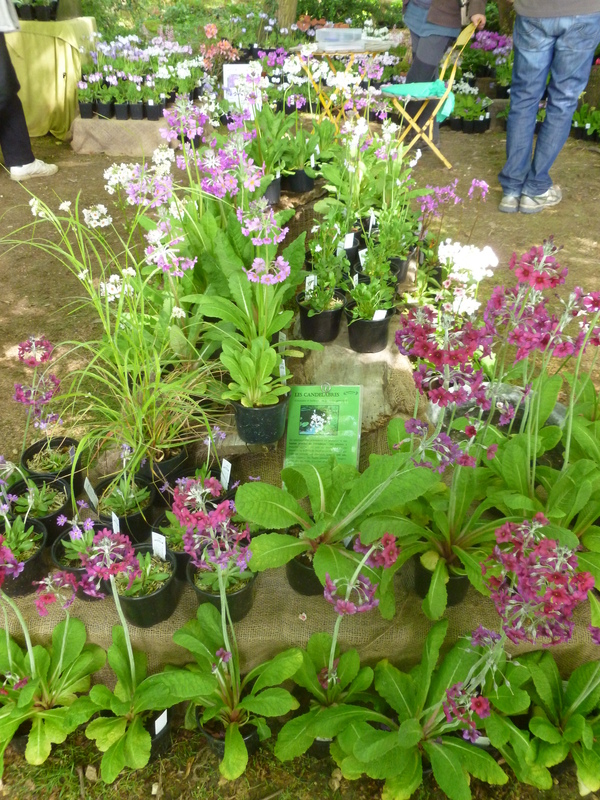 The stall holders are also able to give good advice about the siting and care of your plant. 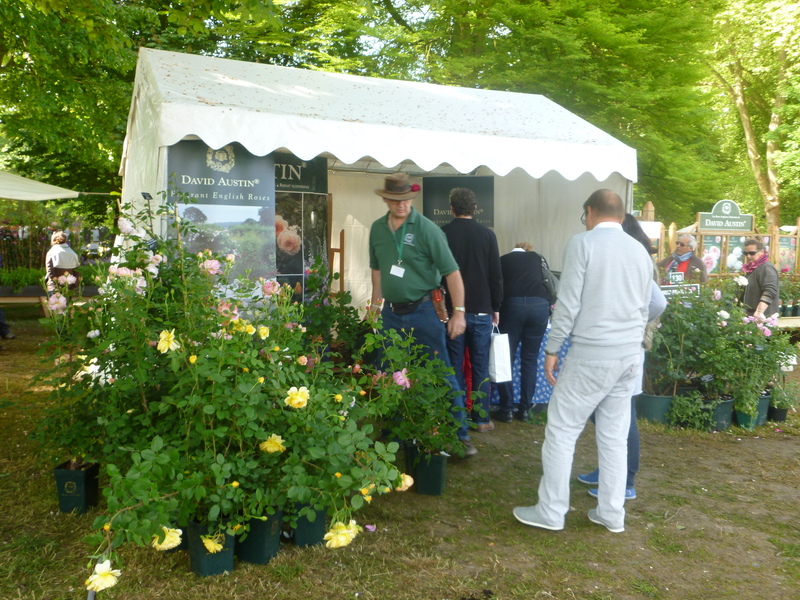 The roaring trade being done by the David Austin stand couldn’t be missed with legions of customers carrying away purchases in large thorn-resistant paper bags. There are a few Courson regulars who are British-owned but France-based. This colourful stand of bedding plants is The Flower Basket, based in Normandy. 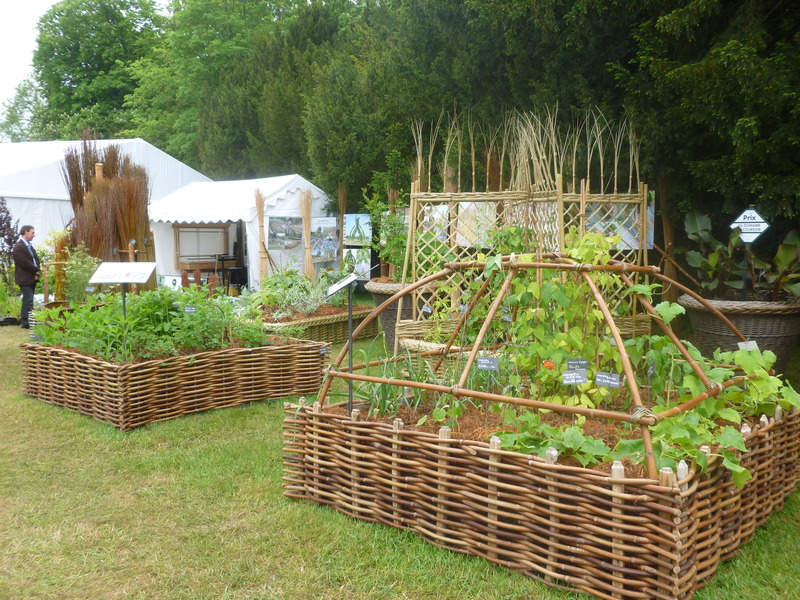 Eric Renault grows and weaves the most beautiful objects from willow and sweet-chestnut including these raised beds as well as planters and living willow fences. 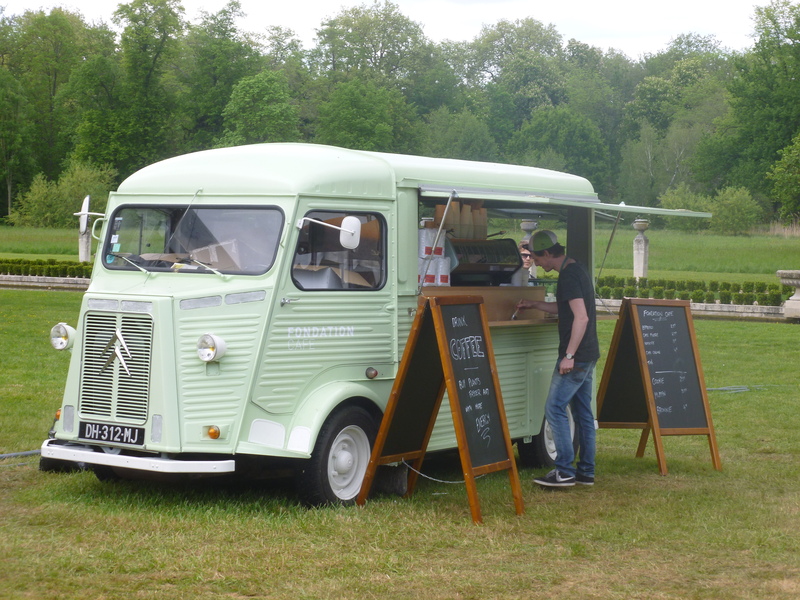 This year for the first time, the event embraced food trucks, including this lovely vintage Citroën van selling coffee. 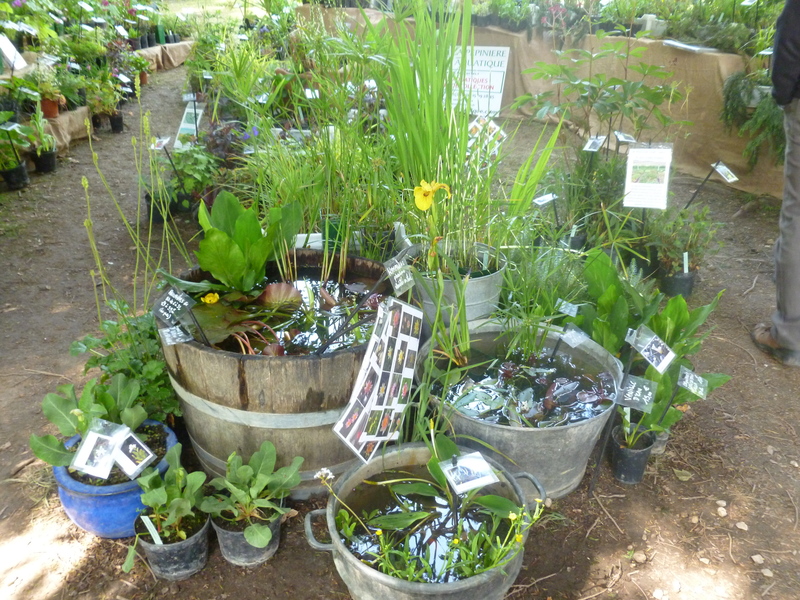 This popular stand organised activities for children around the theme of plants and nature. 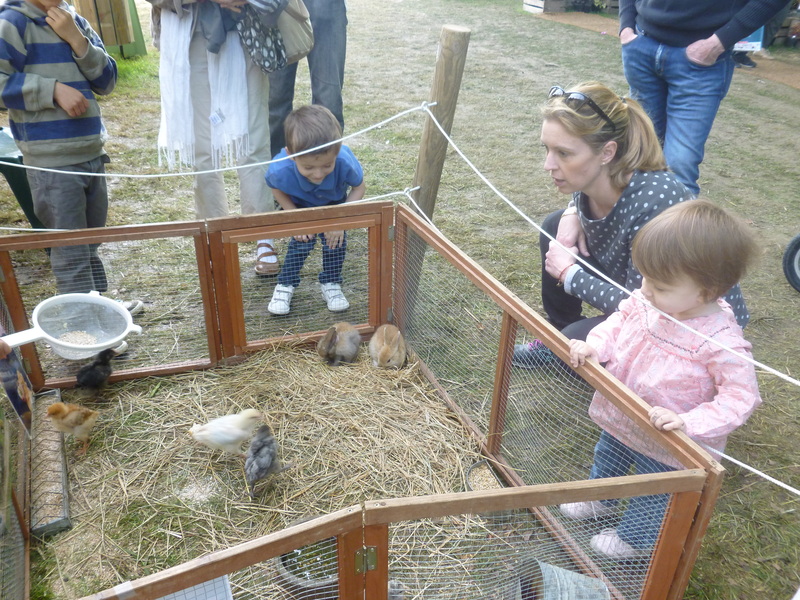 Their sweet chicks and baby rabbits were very popular. 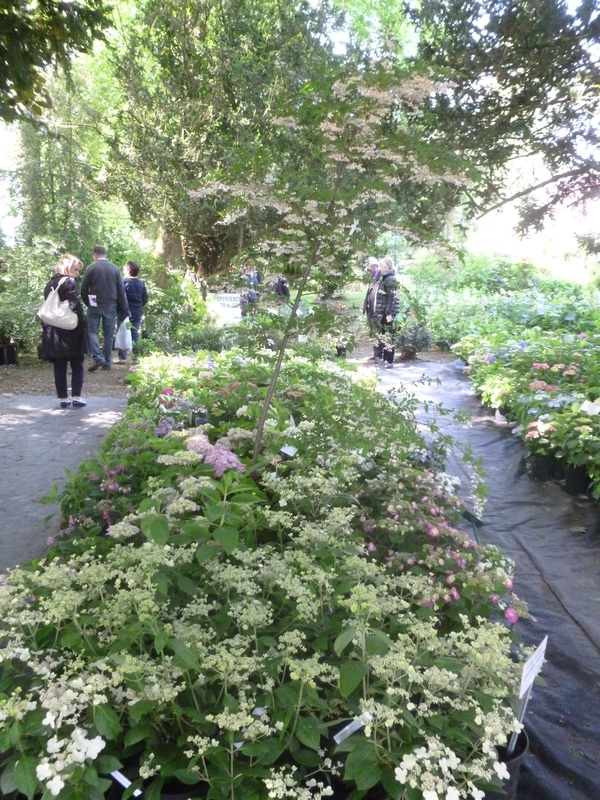 The shadier areas of the park were sensibly filled with nurseries selling more shade-tolerant plants including this one with a flowering Styrax japonicus and hydrangeas. 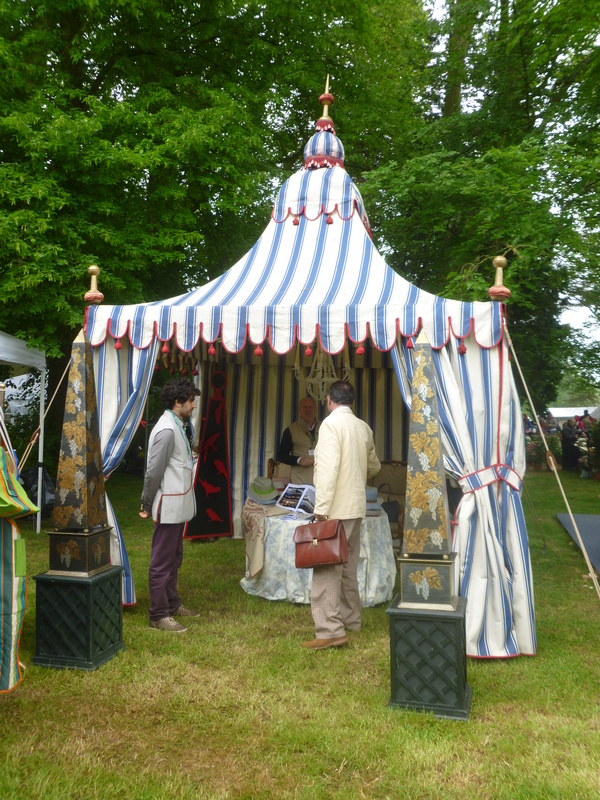 This flamboyant striped tent would be perfect for one’s 18th century themed picnic! 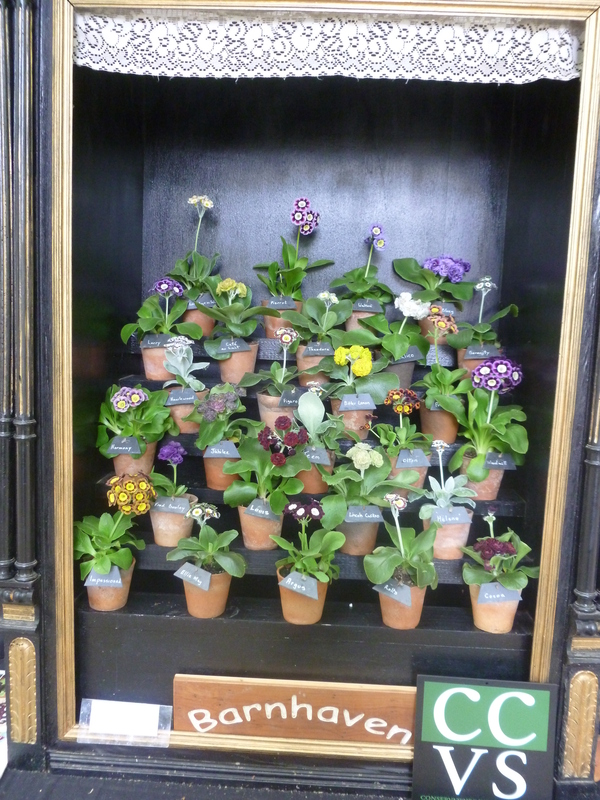 Barnhaven Primroses, based in Brittany, must be a mecca for any primula fan. The March edition of the RHS ‘The Garden’ magazine featured an article about the history of the nursery, founded during the Great Depression in the United States by American Florence Bellis. She was responsible for hybridising many new strains of primula including the Barnhaven and Cowichan Groups. On retirement she sold her collection to a nursery in the Lake District, who in turn sold it on to a nursery who moved to Brittany in the 1990s where it still remains, selling primroses, primulas and auriculas (seeds and plants) world-wide. The current owners are committed to keeping the Barnhaven strains going and propagate seeds and plants using Florence Bellis’ hand-pollinating techniques. The nursery holds the French national collection of Barnhaven primulas and the French Certified collection of Primula auricula cultivars. It’s not just plants that tempt you during the show. 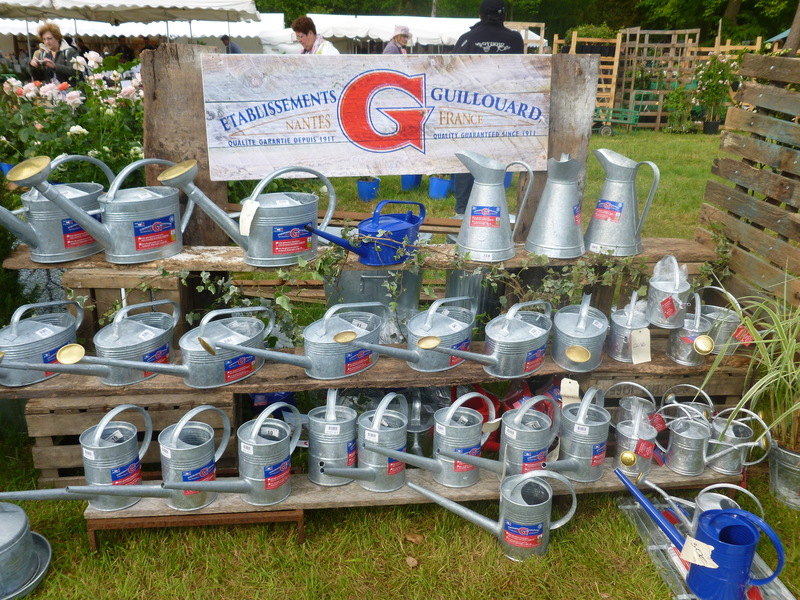 How about a traditional galvanised watering can – in a range of sizes? 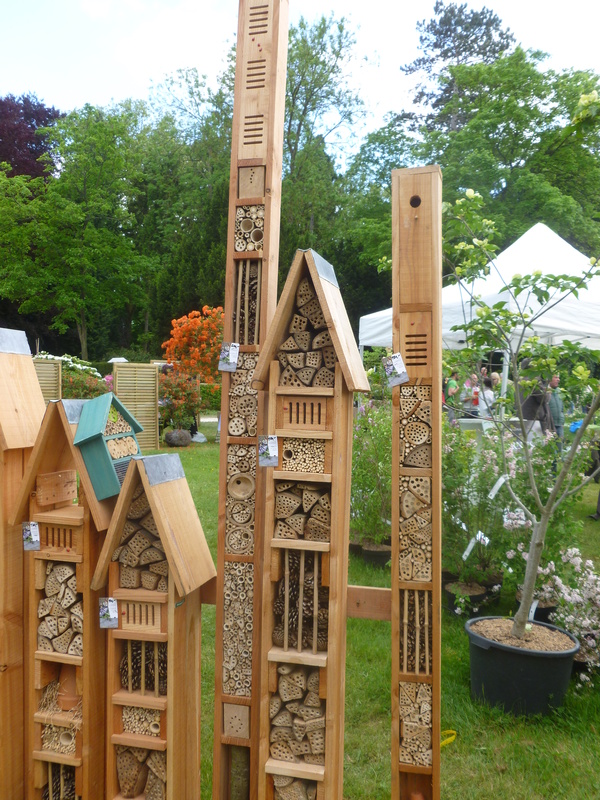 Or insect hotel towers to create a Manhattan for bugs? Box blight and box-tree caterpillars are wreaking havoc with the traditional French box parterre. 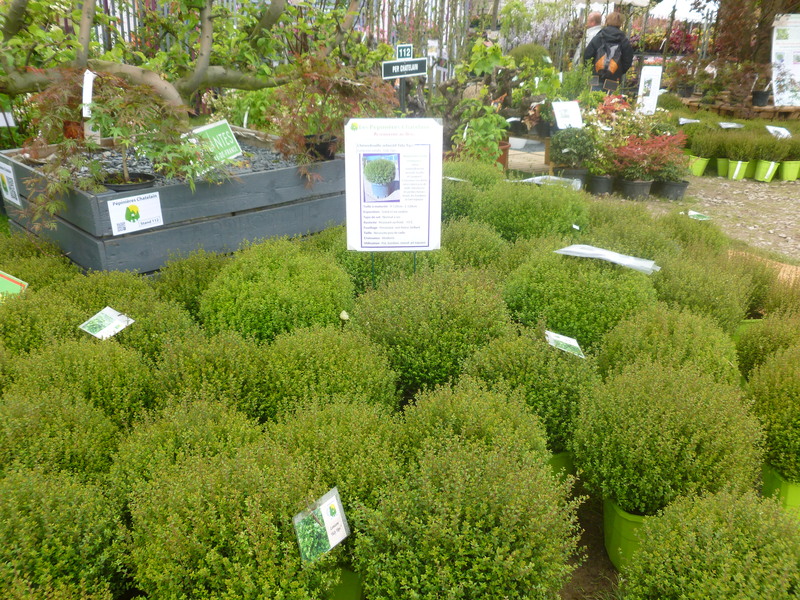 In a sign of the times, this forward-thinking nursery is offering balls of Lonicera nitida ‘Tidy Tips’. It was lovely to spend more time at the show this year and to have time to chat and buy plants from some of my favorite regulars. I also was thrilled to meet Roy Lancaster who is on the jury for the plant awards. He and his wife were both charming and seemingly not tired of chatting to bothersome fans like me! I bought a vintage Dutch hoe from Oxfordshire-based Garden & Wood as these are impossible to find in France; though it’s such an object of beauty that for the moment it is just decorating our flat. I bought shade-lovers from ‘Sous un Arbre Perché‘ and the Pepinière des Avettes as well as sun-lovers from Burgandy-based Le Jardin de Morvan. The May show is always full of iris, peonies and roses but this year flowering Cornus kousa ‘Venus’ seemed to be the plant of the moment. Some of the nurseries I spoke to said that although the foot-fall seemed greater than previous years, their sales had been lower, perhaps because the rich folk from the west of Paris didn’t attend, but hopefully it’s just because the new location is yet to be discovered. I’ll certainly be going back in October. Les Journées des Plantes de Courson à Chantilly (such a mouthful!) take place twice a year, in May and October. Tickets for the May show cost 20€ or 12€ for children, though if you buy tickets in advance they are 17€ or 10€. The October show will be held on the 16th, 17th and 18th October 2015 from 10.00 to 19.00 For the official information about the show follow this link. There were a number of food trucks as well as a restaurant for lunches though the queues were very long at the May show. Perhaps they will provide more in October. If you are a British expat, bring money for the fudge stall! Picnicking is allowed. There were rather long queues at toilets too, so hopefully this problem will be solved by October. The show is mainly on grass/mud, so waterproof shoes are recommended. For more information about visiting the Chateau de Chantilly, the Musée du Cheval or the gardens, follow this link. To get to the show by train, the stopping Paris-Amiens service from Paris Gare du Nord stops at the station of Chantilly-Gouvieux. The journey takes about 20-30 minutes. 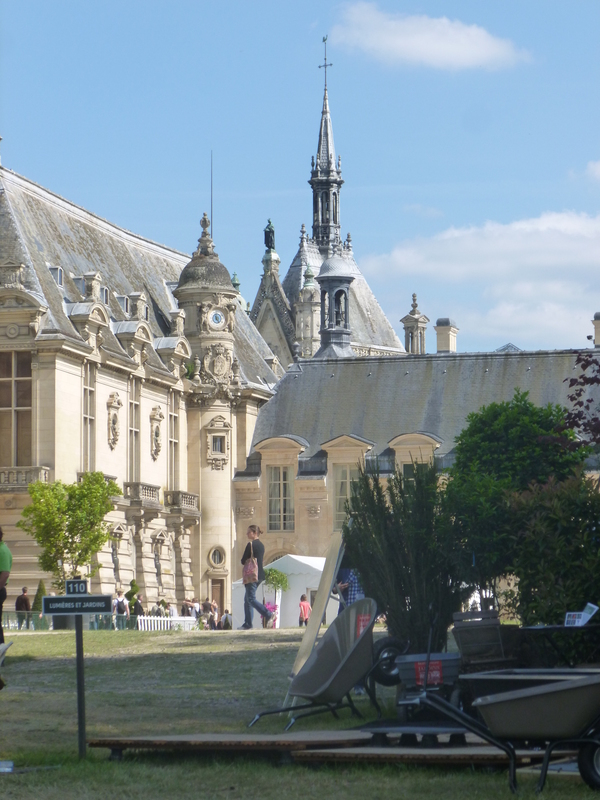 There is a free bus shuttle service which leaves from the Chantilly-Gouvieux Bus Station (Gare Routière) which is just to the left when you come out of the railway station entrance. Be careful, the last bus back to the station from the château at the end of the day leaves at 18.45.
mick@opengardens.eu or go to http://www.opengardens.eu. 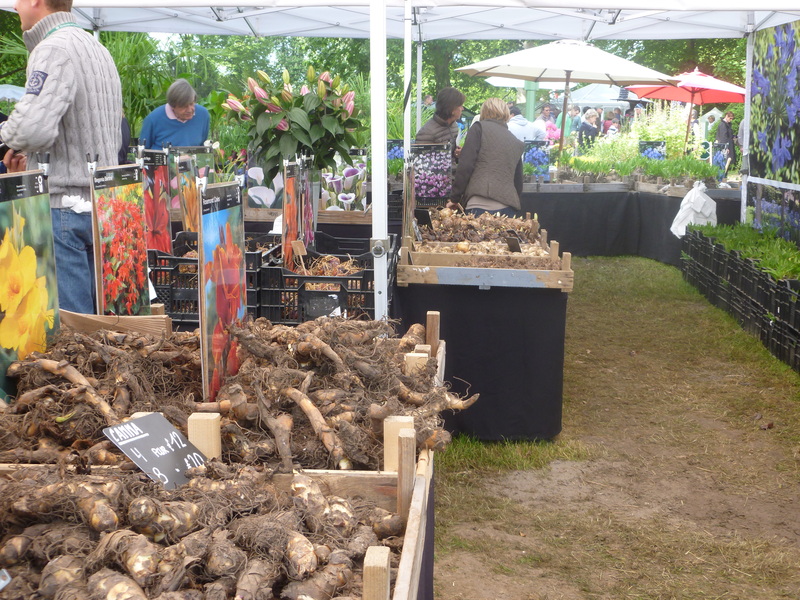 Here are links to the previous blog posts I have written on the Journées des Plantes à Courson in May 2014 and October 2013. I hope to get to France in the not too distant future, but probably not for this. An exercise in frustration for Americans, who can’t take plants home. But I enjoyed reading about it. Thanks! I hope you do come to France sometime so we can meet up. The itinerary of your trip to England looked fantastic.